The UNT dance team is never short of amazing talent. Jennifer, the dance coach wanted some casual and lifestyle portraits. I was happy to take these for them. We headed out to the New stadium in Denton, TX. 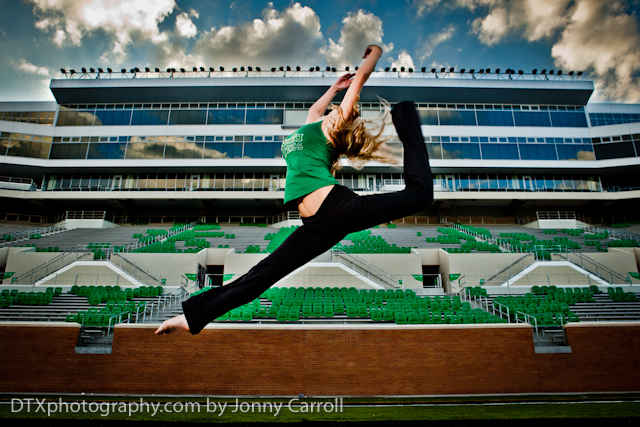 I did some photos for the UNT dance team back in 2008. Since then I’ve seen several of the girls go on to be Dallas Cowboys cheerleaders, Mavs Dancers, FC Dallas dancers and Stars girls. Additionally a few of them contacted me in need of head shots. I had one challengeing goal in mind. To take a different photo for each girl. We were able to get a lot of great shots. All that look unique to each other. I was really happy with the results. All the photos were taken at the new University of North Texas Apogee stadium. Here’s a cute team shot. I had a good time taking lifestyle portraits and photography of the North Texas Dancers.